EW! Grim! Very excited (okay, that sounds awful, but maybe you know what I mean?) about checking this out -- it's very close to me! That *is* exciting; do let me know if you do take a trip - it's a wonderful looking house! It sounds like an extreme crime of passion! Doesn't it? I imagine that Elizabeth resolutely refused to give Fairbanks the commitment he was seeking and he exploded. A horrible tale! I can't believe the house is still there. It is indeed; the oldest wood-frame house in the USA, it now offers bed and breakfast! What a great subject! Antiquarian 'Jagged Edge' with a lot of twists and turns. I imagine the B&B side of things is a great crowd puller but I can't ever imagine overnighting there! It's a fabulously creepy looking house! And ...History repeats itself today as you read so often in the news about antics of would be Jason's of the world re-creating this scene over & over. 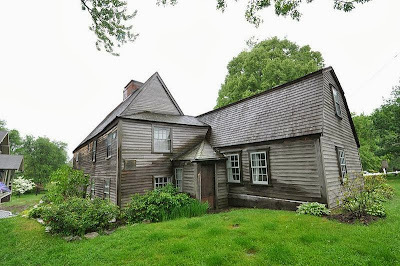 Love the old Historical Homes of New England_I visited many when we lived in New Hampshire. My favorite is still "The Mount" (Lenox,Ma)_home of my favorite Author Edith Wharton.Nice read! Thank you for your visit! I would love visit New England (and one day, hopefully, I will!) sadly though history repeats itself all too often on this sort of story. He should have waited and breakfasted in Canada! That's not the reason he deserved what he got.